Hang in there, we've got your back. 👍 In this article, we explain the types of warning messages that can appear when you're exporting time to Xero, and how to quickly fix them so you can get on with your work. 2. When Does It Appear? This error message appears when you are attempting to export time for an employee who isn't mapped to an employee in Xero. Click the "Pen" icon on the right of the screen, and select the correct ClockShark employee from the available list. After the employee is successfully mapped, you can try exporting time again. 2. When Does It Appear? This warning appears when you are exporting time records for an employee who already has a timesheet in-progress in Xero for the pay period (or days) you've selected to export. Xero calls timesheets in-progress "drafts." You can see these from the Payroll > Timesheets screen in Xero. 3. Why Does It Show Up? If an employee has a timesheet in-progress in Xero, and you export more time to it, ClockShark will overwrite the whole time sheet with just the days you've selected. Any day you don't export time for will be a "0" value on the timesheet. If you do happen to see this error, change your dates to include the whole pay period so that when you "overwrite" the Xero timesheet, it overwrites it with the same hours you had originally. 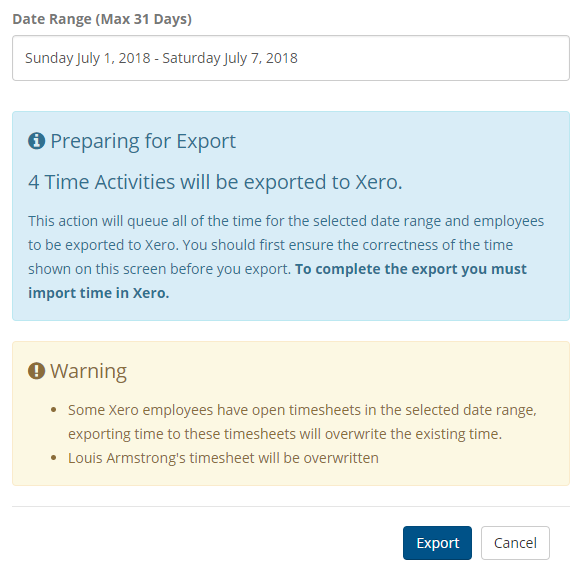 Your second option is to export the time to Xero (ignoring the warning), but then manually add the time to the employee's timesheet in Xero. 2. When Does It Appear? This error message appears when you are exporting timesheets to Xero, but the associated employee's Xero timesheet has already been approved. 3. Why Does It Appear? Exporting time to an "Approved" timesheet in Xero is like trying to make hand prints in dry cement. It's too late. 4. How Do I Fix It? If you have access to Xero, you can log in and go to your Timesheets screen where you can revert the approved timesheet to a "draft." We hope this helps explain some of the common warning messages you receive when exporting time to Xero!